Somehow, after years or unsuccessfully starting blogs and wishing I could actually be part of the fashion blogging community, I managed to keep this old thing up and running for two years. Last week marked my anniversary, and I wanted to celebrate the same way I did last year: with a giant giveaway to thank everyone who has supported me. As I've mentioned before, one of my favorite parts of blogging has been getting to know some great small businesses. I love supporting "the little guy," and I'm grateful for the opportunity to help give them the exposure I think they deserve. 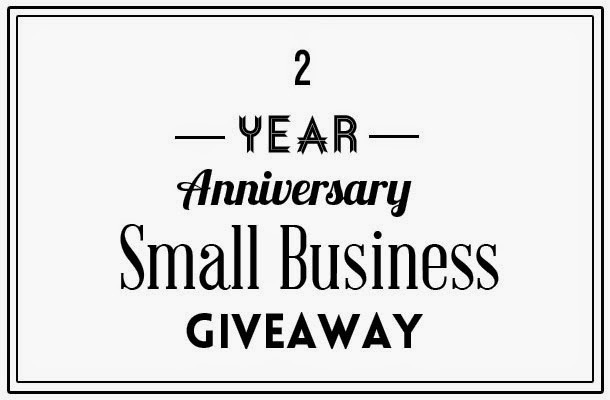 I'm so happy to announce that SEVEN of my favorite small businesses are donating some amazing items and store credit, and one person will win it all. Even if you don't want to enter (but why wouldn't you? ), I still hope that you'll at least get to know the businesses and follow them after reading this. I do hope you'll enter though, since getting to know all of you has also been one of the best parts of blogging, and the least I can do is make you all compete for a bundle of great prizes. Just kidding. I wish I had enough awesome items to give to each and every one of you. Everything Darling is an online store that's just that — darling. Run by two of the sweetest girls, Natalie and Grace, from close to me in Southern California, Everything Darling has an adorable selection of clothes and accessories. I'm completely smitten with the fit and flare dresses and cute satchels. All of the items in the shop are wonderfully feminine and completely versatile. You can read more about Everything Darling (and see how I styled one of their dresses) through my interview with Grace and Natalie here, and the two are offering up $20 to the shop today. Jennifer of Hello Cheeseburger just gets my taste in jewelry. The store's mix of statement and every day pieces is perfect, and I find myself wanting just about everything. Jennifer sent me one of my favorite statement necklaces, and it's pretty obvious by the selection in her store, that each piece is chosen carefully. Among the sparkly jewels and simple state necklaces (that we all need), are great stamped pieces like an ampersand necklace (my weakness). But let's be honest. Would anyone really want this necklace to say anything other than pizza? Okay, that's just an example she uses and you can have it say whatever you want, but come on. We all need pizza necklaces in our lives. Jennifer is offering $25 to Hello Cheeseburger. I never thought of myself as a headband person until I was introduced to Salvage & Stone. The shop's owner, Nic, crafts some of the cutest ones I've ever seen, and she successful converted me into a lover of them. Not only does Salvage & Stone offer some top-notch headbands, they're all made from mostly recyclable materials, as is everything in the shop. This means that you can look cute and feel good about yourself while doing so, which is really just an added bonus. Nic also has a personal blog, and she always nails it with her outfits. You can read more about Salvage & Stone and see how I styled a headband in my post here, and get a chance at winning a custom-made headband through this giveaway. A fellow Flock Together girl, Lisa of Lala Faux Bois is constantly giving me reasons to be jealous impressed. Her killer style and adorable cat definitely near the top of the list, but lately, it's been her jewelry making skills that I'm in awe of. Not only is Lisa incredibly sweet and funny (trust me on this; I met her in person), but she also makes the most lovely jewelry. Her shop, Paperplane, is stocked with gorgeous minerals and quirky charms, all of which I'd love to call my own. That's not even mentioning the great vintage pieces that round out the selection. Needless to say, the winner of this $30 store credit that Lisa is offering up will have plenty to choose from. Speaking of Flock Together girls, it's no surprise that another one, Marisa of The Shades of Monet Chronicles has a darling vintage shop, Ally Hoot Vintage. Marisa is not only the master at pattern mixing, but she has a keen eye for unique pieces to keep in her store. Right now, Ally Hoot Vintage is stocked with bright colors and fun prints that are begging to be paired with sandals and wide brimmed hats for summer. The winner of this giveaway will receive $30 to Ally Hoot Vintage, but everyone else is in luck too. Marisa is being kind of enough to offer my readers 20% while this giveaway is running using the code "Room 334." Cheerful vintage frocks for everyone! In case it wasn't made obvious by both this giveaway and my style, I really dig minimalist, but interesting jewelry. This brings us to Aether Design, another great jewelry shop that I'm in love with. I can't tell you how long I've been drooling over that antler ring, but it's not the only thing worth mentioning. Amber creates pieces that work well for every day, but manage to feel special. Maybe just knowing that the pieces are handmade in England has something to do with their appeal, but either way, they're all gorgeous. Amber is offering the lucky winner $40 in store credit, which could do some serious damage if you're looking to buy me that antler ring. Whoever wins is planning on sharing the prizes with me, right? Ever since I worked with Amanda of Two Tickets on another giveaway not too long ago, I've loved keeping up with the shop through social media. There's something about the way Amanda crafts her pieces. They're all completely unique and unlike anything else I've seen before, which is tough feat to accomplish. For this giveaway, Amanda is offering up this lovely coral tassel necklace. I think we can all agree that the color is gorgeous and it would make a great piece against a simple black summer dress. I can see this necklace working a number of ways actually, and I can't wait to see how whoever wins will style it. Just enter through the Rafflecopter widget below! This giveaway closes on Monday, 06/16 at midnight. Congrats on your 2 year mark, Elana! Congrats on 2 year, Elana! Happy 2 years Elana!!! Thank you for the sweet things you wrote about me and my shop- I'm excited to be a part of the celebration! The cat earrings from paperplane are so cute! congrats on two years, Elana!! Happy two year blogiversary!! I'm glad you started a blog because I love reading it! Congratulations on two years of blogging, Elana!! Wow, congrats on two years. That's no small achievement! Also, this is an insanely awesome giveaway!! so many amazing small businesses on here!! & congrats on a successful 2 yrs blogging Elana! Congratulations again. I can't wait to see what's in store in the years to come. how did I miss thisssssss?! such a great bundle, and I would have POSSIBLY had that last year's winner's luck. I'm kicking myself for not seeing this in time!